Wah! Brian Joo & Alexander come Malaysia again!! PD Beanz Entertainment will bringing Brian Joo & Alexander Lee Eusebio to Malaysia to hold their Charity Concert of 3rd Wave in this coming December. 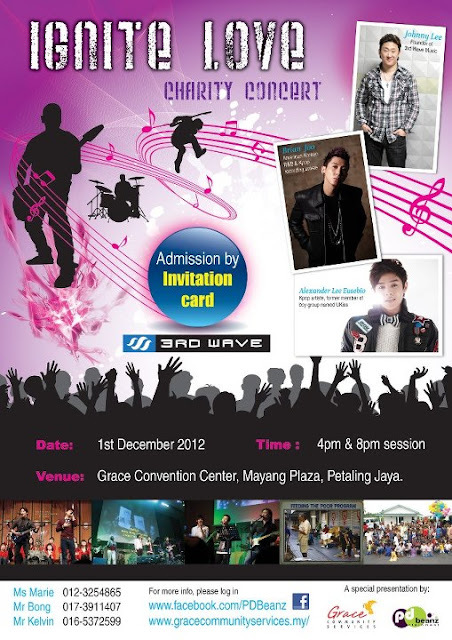 This concert will be held at Grace Convention Center, Mayang Plaza, Petaling Jaya on the 1st December 2012. This concert have two session - 1st at 4 pm & 2nd at 8 pm on the same day. A) Front Seat (limited seat) - Contribution will be RM 80 each. B) Back Seat - Contribution will be RM 35 each.